Ciara Mageean is leaning towards taking a year out from study as she continues to mull over scholarship offers from a number of US universities. Villanova, Providence College, Harvard and Auburn University are among the institutions who have made approaches to the World Youth silver medallist. However, Mageean told BBC Sport that she may opt to delay her decision about the American collegiate offers. "I'm contemplating a gap year," said the 18-year-old Portaferry athlete. "That might be something good to happen. To be able to wind down a bit after a rather hectic three years. "With all the exams and the athletics, it has all kind of taken off," added Mageean, who is currently in the middle of her A Levels in Biology, Chemistry and PE. Mageean will concentrate on her exams over the next couple of weeks before taking part in the annual junior international meeting in the German city of Mannheim early next month. "It's always a good junior international event with a good standard of competition. "I've run a personal best most of the years that I've gone there and it will be my first race in July." The Mannheim meeting will be part of Mageean's build-up to Mageean's main summer target - the World Junior Championships in Canada in late July. "Once I get the exams out of the way, I can get into good hard training every day - although I am doing some training every day at the moment. "I'll just to able to train that bit harder. It is always a stress having to think about exams during your training." 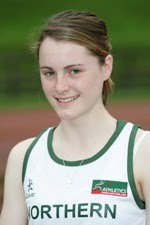 Mageean took a break from her exams on Saturday as she eased to an emphatic victory in the 1500m at the Northern Ireland Championships.